It is difficult to support and to love an institution if we don’t know its history. However, to condense the millenarian and glorious history of the Sovereign Order of Saint John of Jerusalem in a few pages, is practically impossible. This succinct chronic recalls some of the principal events that have contributed to the historic evolution of the Order, from its origins up to the present. At the beginning of the eleven century, the Saracens had already been occupying Jerusalem for about 500 years. In 1020 Caliph Dehara Ladimellah granted permission, to a group of Amalfitan sailors, to establish in Jerusalem a district provided with commercial quarters, lodgings for travelers, churches and shelters for sick people and pilgrims, often victims of violence and persecutions. A monastic brotherhood of Hospitallers, which could be considered the initial nucleus, and certainly the most significant of the Order,was created for the purpose of managing the “Domus Hospitalis”,dedicated to Saint John the Baptist, which gave hospitality to men,and the Hospital of Saint Madeleine, which gave hospitality to women. In the year 1090, that “Sacra Domus”, was administered by Benedictines, their master was Fra Gerardo de Sasso, born in La Provence, according to some accounts, or on Amalfi, according to others, who miraculously had escaped death. 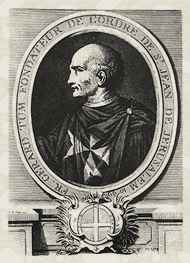 He is recognized as the first historical figure and the first Grand Master of the Order, and was elevated to the honor of the altars among the Blessed Hospitallers. Shortly after its foundation, the “Domus Hospitalis” became the focal point not only for the traders of Amalfi, but also and especially for the anonymous and destitute mass of people in pilgrimage to Jerusalem, the holiest place of Christianity. In 1099, at the end of the first Crusade (1095-1099), Godfrey of Bouillon reconquered Jerusalem, and Baldwin became its first King. The “Sacra Domus” experienced its most glorious moments and began to develop a supporting action, not only in favor of traders and pilgrims, but also to the growing Brotherhood of “frates” which was expanding alongside all the holy places. This Brotherhood that had acquired its own characteristics and became an institution, began to act in favor of the Crusaders. In the year 1100, the Brotherhood received donations from Godfrey of Bouillon himself, from Roger of Sicily, and from many other Christian princes. Those donations could be considered lawful titles of that sovereignty that eventually became the main characteristic of the Order, and made of it a Nation without frontiers, a Kingdom without dynasty. By virtue of the pontifical bull of 15th February, 1113, and following acts, the Pope Pascal II approved the institution of the Hospitallers of Saint John of Jerusalem, free from any civil or ecclesiastic authority. The little Brotherhood stretched beyond the borders of Palestine, and extended all over the Christian dominions, where authorized by the Pope, was allowed to receive donations and to found houses. The presence of the Order in Jerusalem was especially significant when, upon the death of Fra Gerardo, a nobleman from Provence, Fra Raymond Du Puy, was called to guide the Hospitallers in 1120. He radically changed the plans, the strategy and the purposes of the institution. The defense of the Latin Kingdom of Jerusalem, and the blooming of the spirit of chivalry were the determinant causes that induced the “frates” to become “equites et servientes armigeri”. By the will of Innocent III, the initial hospitaller tasks were supplemented with military functions. It was an original fusion: military forces defending the Christian dominions, and hospitaller charity defending life. The religious and chivalric structure founded legitimacy through the concept that to defend the Latin Kingdom of Jerusalem, which God wanted, was a duty that not Christian could evade. The Knights, who had adopted as badge the octagonal white cross, fought for the defense of the ailing and the weak, for the pilgrims, for righteousness and justice. They were bound by three religious vows: obedience, poverty and chastity. The chaplains safeguarded the offerings and the “frates” healed, comforted and buried the unfortunate. The King of Aragon, Knight of the Order, on his death bed bequeathed all his possessions to the Knights, living them in usufruct to be managed by the Templar holy places. Meanwhile the Knights took part in the 2nd Crusade (1147-114Knights and the Knights of the Holy Sepulchre, who were protecting courageously the 9) and partook in a particular way in the expedition against Damascus (1148). The Order replenished its reserves, opened settlements in many states, received properties all over Europe, and became the bastion of the Christian faith. In 1187 Saladin, after having many resounding victories and conquering so many territories, crossed the Jordan river. Despite the brave defense, the Grand Master and many Knights of the Order, Templar Knights and Knights of the Holy Sepulchre, were killed in the vain attempt to stop the infidel from reconquering Jerusalem. The Seat of the Order was transferred to Margat, in Syria. During the 3rd Crusade (1189-1192), guided by Richard The Lionhearted, with the military contribution of the Knights of the Order, Saint John of Acre was liberated and became the new Seat of the Order. On 1265, the Sultan attacked and reconquered Tiro, Cesarea and Margat; only the Crac resisted, a fortress built to resist sieges even for long periods, but finally it was lost. 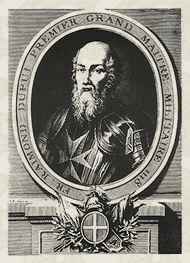 After an heroic resistance, the Grand Master Jean De Williers abandoned the last strongholds of Saint John of Acre on 1291.